Apple was recently granted a patent for a touchscreen car dashboard, one with a twist that could set it above other in-car touchscreens. Coupled with their announcement of their iOS In The Car app earlier this year, it shows that Apple is serious about moving in to your next car. Recently-approved U.S. Patent 8,482,535 shows Apple has patented a car display interface that will control a wide array of features including navigation, music, heating, windshield wipers, and defrosters. The latest patent is a continuation of an earlier one that dates back to 1992. FIG. 1C Illustrates one example of a conceptual vehicle basic dash board (1) and center stack (5) with tactile displays and/or touch screens made possible by this invention, incorporated in the steering wheel center, the center stack, the console, the passenger side of the dash board, and possible the instrument cluster itself, not here illustrated. The twist here is that Apple's patent could also offer tactile sensations to the user. As you operate the display's knobs and sliders, the screen responds with "feedback that’s above and beyond the subtle vibrations we’re used to when interacting with a slab of glass," according to Wired. Apple Insider took an in-depth look at the patent, and they say the screen could include features like raised ridges, indents or grooves that make the controls easier to operate by hand when one's attention should be focused on more important things, like, say, actually driving the car. Certain controls disappear from the screen when they aren't needed. Apple wouldn't be the first company to offer a vibrating sensation on their touch screens. Cadillac CUE also offers haptic feedback, as do other systems. And given the sheer amount of car functions relegated to the touchscreen in this patent, it also reminds me of the giant iPad-like interface used in the Tesla Model S.
Presumably, this system would integrate with or at least be similar to iOS In The Car, the app that puts an iPhone-like interface into an existing touchscreen dashboard and will be offered by a dozen automakers starting next year. It's hard to see every carmaker going for it, though. BMW has said they're pretty cold to the idea. 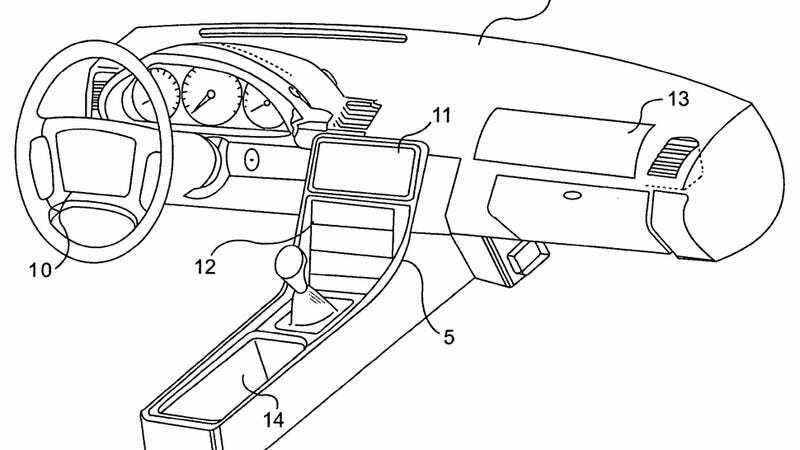 It's hard to say how, or if, this patent will come to fruition on modern cars. The drawings here do look fairly dated, and they allude to touch screens on the passenger-side dashboard, which would be hard to integrate given the modern requirement for airbags there. Still, it's an interesting look at where Apple could decide to take cars in a few years. We'll have to see if the carmakers themselves want to be along for the ride.